Restrooms in Japan have come a long way. The first time I used a Japanese-style toilet—now over two decades ago—I was so perplexed by it that I stood there in a stupor for a good 15 minutes. There it was, a long porcelain basin on the ground with a hole leading from here to the center of the Earth. Forget that paper seat cover; you’ll be squatting. Never mind that your pant legs are falling dangerously close to the ground. Just aim. 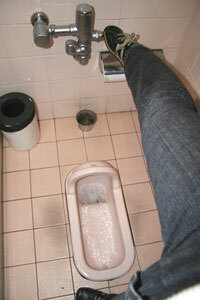 Though once you get used to a washiki toilet you realize that it’s actually not that bad. In fact, it’s quite sanitary. Japanese toilets are a rare sight these days. Westernization has made way to what we Americans might consider ‘regular toilets.’ Reversely, a youshiki toilet proves perplexing to countryside grandmas, many of whom figure they could just stand right on the toilet seat to do their thing. “Please come down from there! You’ll hurt yourself,” I feel like telling them. They say that Japan doesn’t invent new technology, rather, it takes an old one and makes it better. Well, that includes restrooms. In most modern Japanese homes, you’ll find an electric-powered toilet seat which can wash, air-dry or warm your bottom depending on what you fancy. At the touch of a button, a little nozzle will appear at the rim to spray warm water. Another nozzle will generate a burst of warm heat like an automatic hand dryer. Yet another button will heat up the seat, making those cold winter days a little more tolerable. Some toilets even have sensors in which the top cover will raise up when you enter, and lower shut when you leave. Women’s restrooms often include a particular function custom made for the self-conscious. It’s called the otohime, which literally translates as “sound princess.” Press the button and you’ll hear the soothing sounds of a waterfall, producing enough ‘white noise’ to silence a wart hog in labor. Face blotting paper:… on We Love Candy! Staff Blog on We Love Candy!